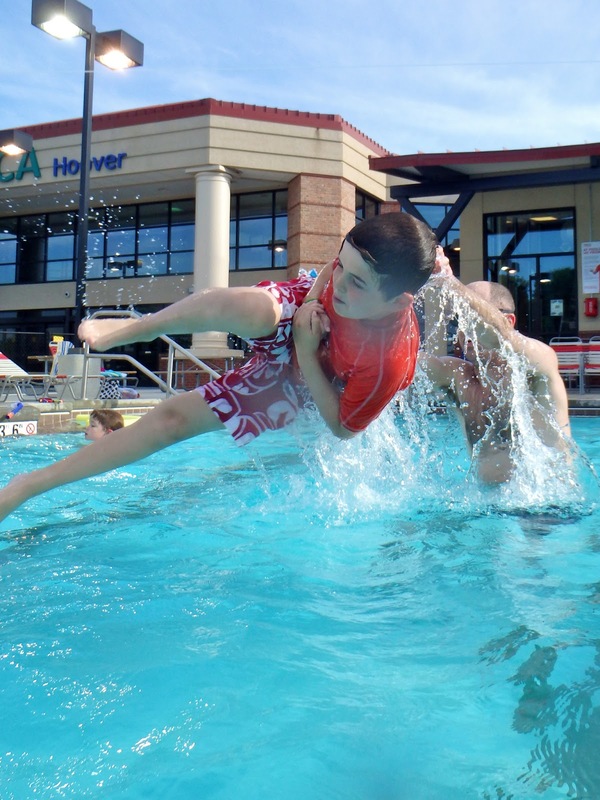 With the chillier weather we've had up until recently, the pool hasn't really been calling our names. Well, it's been calling the BOYS' names for months. But not mine. 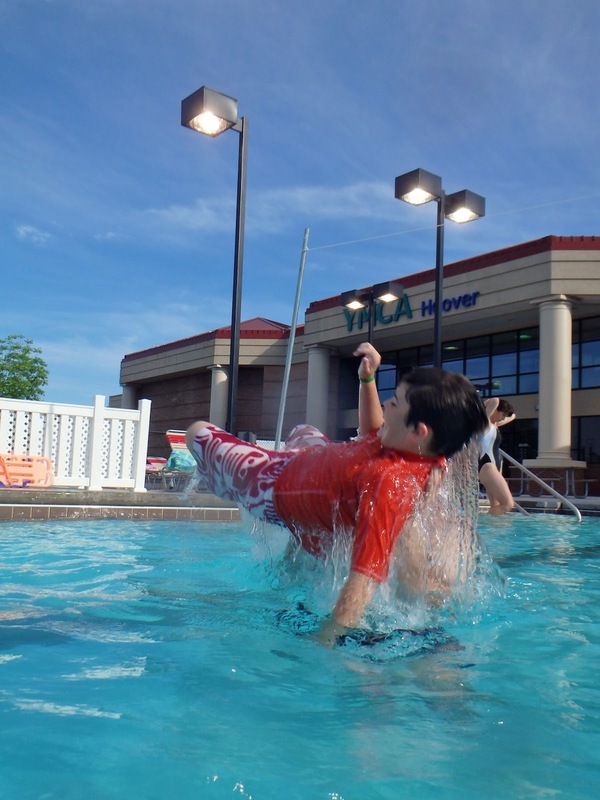 See, the Y's pool is heated. But only the water is heated. They can't do much about the air OUTSIDE the water. Nonetheless, last weekend we finally had a day that cooperated, so we loaded up the kids and headed over. I wasn't sure if Amelia would be wary of getting in, because she was so young last summer when she floated around in the water in my arms. 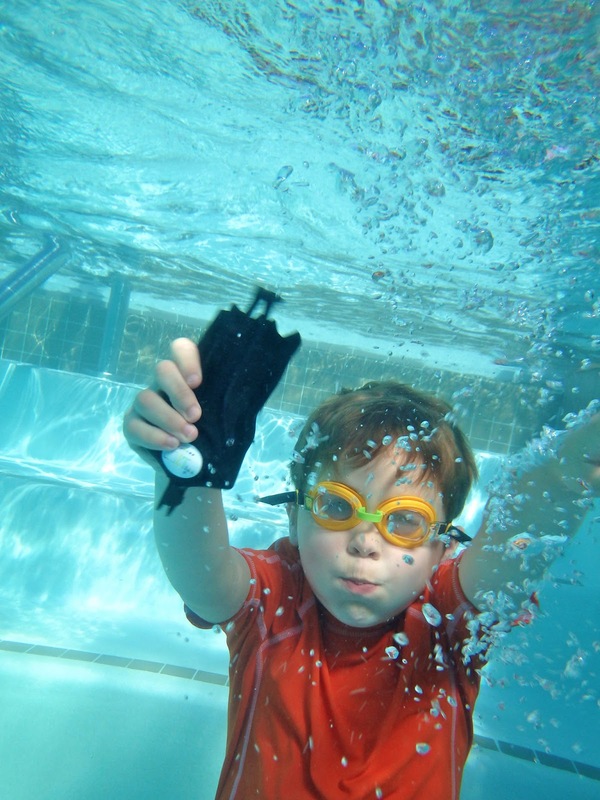 I took my new underwater camera (for those who asked, this is the one I bought in Hawaii, but this less-expensive one also gets good reviews) and took some shots of the boys swimming. I mean, they may not look as adorable as they do ABOVE water, but I'd argue that they certainly look more appealing than I do underwater. Well, then there was Jake. "MOMMY, WATER KEEPS GETTING IN MY GOGGLES." I straightened them out for him and sent him back under. I think that fixed him up nicely. I wasn't sure if Jake would remember everything he learned last year, but he did. He could still swim half way across the pool, kick his way to the bottom, and spent most of the afternoon chasing his Batman dive stick. Total champ, once we fixed those "broken goggles." It's great to have a dad who's willing to play in the pool with you. 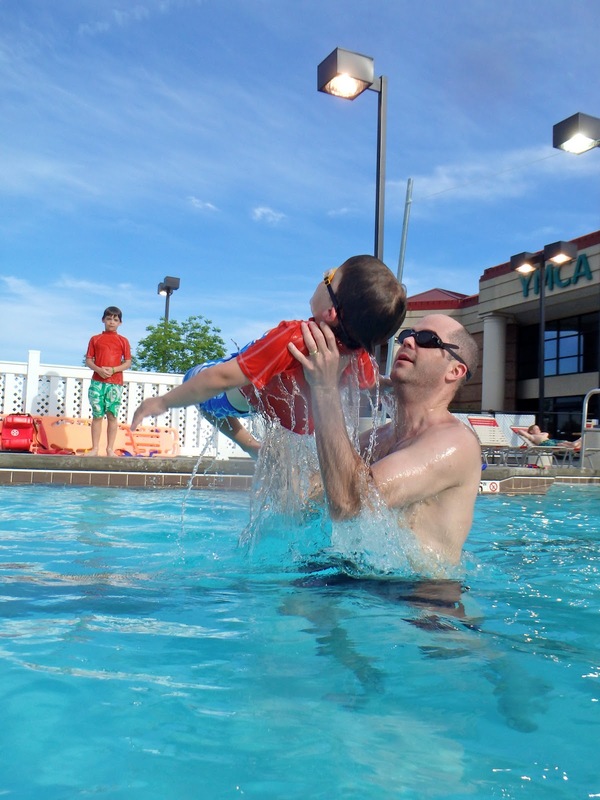 I have years of fond memories of pestering my dad to do the same things with me at the pool. "Throw me really high, Daddy!" "Let me swim around on your back, Daddy!" Never mind if it leaves all the daddies with no top epidermal layer on their shoulders or backs. It's all about the fun for the kids, right, dads? Amelia kept my hands pretty full most of the afternoon, but she was pretty much up for anything. 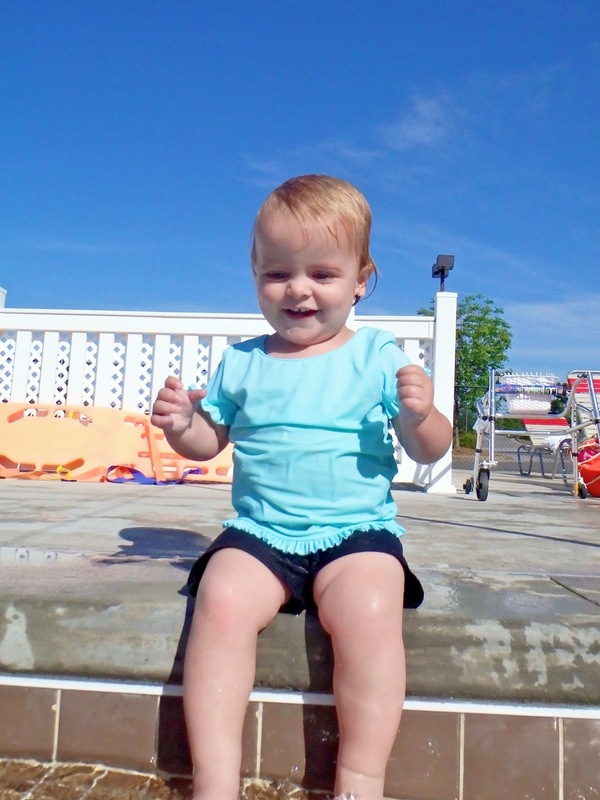 She loved sitting on the side and testing the water with her fingers and toes. But she didn't hesitate for even a millisecond when I asked her to jump in to me from the side. I said, "One, two, three!" and she jumped to me. About 20 times in a row. And I do have pictures of it, but you got a whole SLEW of pictures of me in a swimsuit in Hawaii, and let me just tell you, I'm over it. OVER. IT. That's it for a while. So here's another one of Amelia. When I told her I needed a break from catching her, she was a little put out with me, but she decided that splashing on the steps was a pretty good substitute. She was willing to fall on that sword IF I FORCED HER TO. 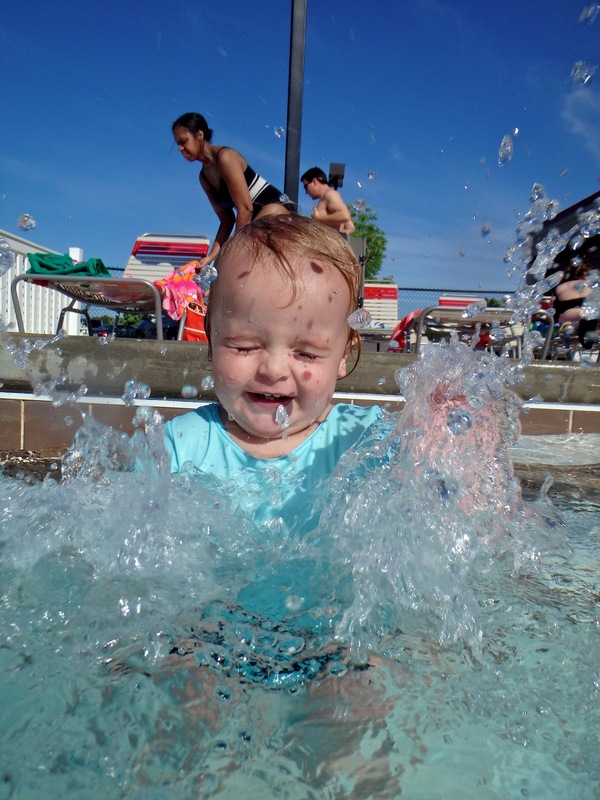 I tried to get a picture of her with Jakey, but she really wasn't willing to stop splashing for even a second. I got about 12 pictures that all looked like this, and then Jake and I gave up. 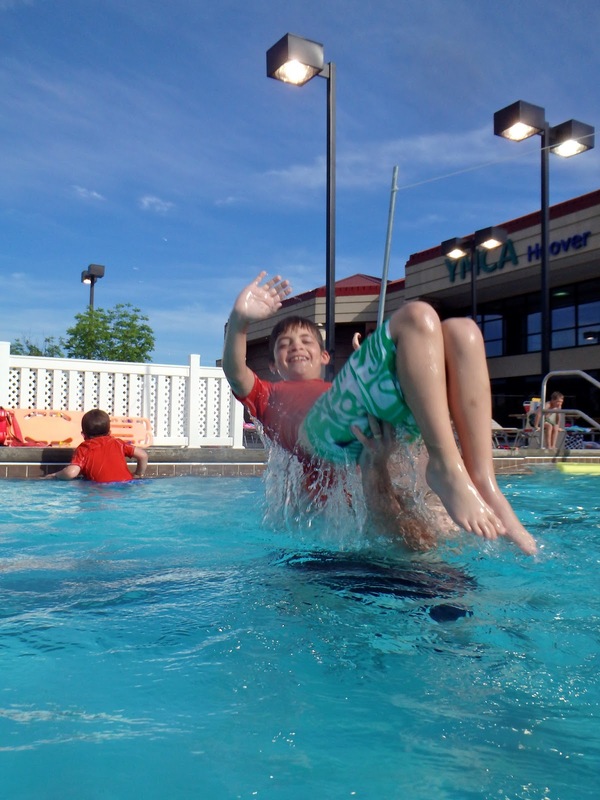 Other than that, there was a lot of children being tossed through the air. Good times. Our neighborhood pool just opened, but it's not heated. 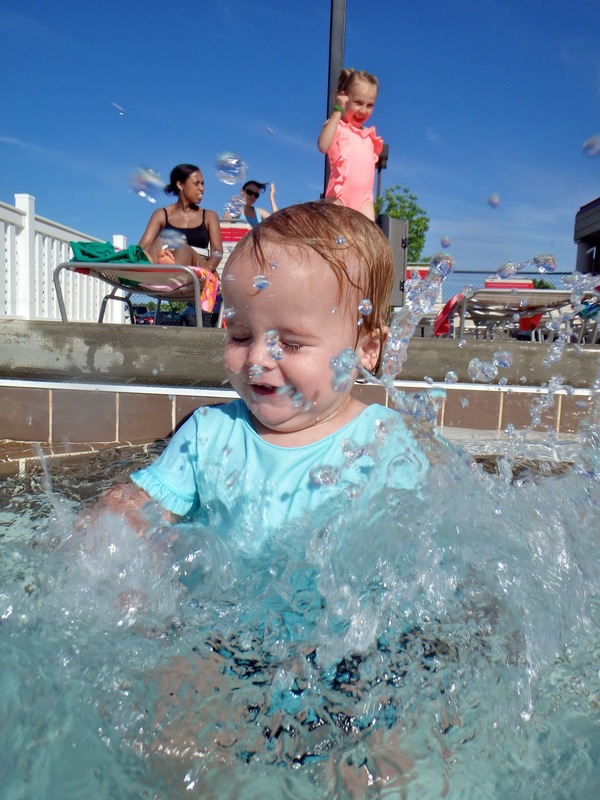 I'm not sure we'll get there this weekend, but if last year is any indication, I'm sure you'll be seeing plenty of pool pictures from now through August. * Those links to the cameras are Amazon Affiliate links, so if you were to click on those and end up deciding to purchase through them, I would get a small commission. I have no idea what percentage, because it's never happened before and it's been so long since I've read the rules that I no longer remember any of the details. But there's your handy-dandy disclosure. your post's to be exactly what I'm looking for. Does one offer guest writers to write content for you personally?